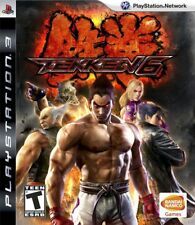 PlayStation3 -- Tekken 6 the Best -- PS3. JAPAN GAME. 57900. Condition is Good. Shipped with USPS First Class Package. The instruction manual is clean and flat with clean corners and the cd is like new, with no scratches. 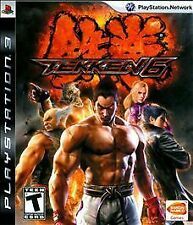 Tekken 6 (Sony PlayStation 3, 2009). Condition is Like New. Shipped with USPS First Class Package. 'Tekken 6'. Included is the original case, manual and cover art all in which are in great condition. The picture provided is of the actual item. (not as described, defective). Disc is in great shape, case shows minor wear. Slip Cover. Artwork / Cover Art. Original Case. 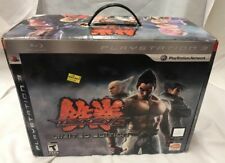 Tekken 6 for the playstation 3, complete with case and manual. All are in acceptable condition with clear signs of wear/use. Excellent case, disc and booklet. Soul Calibur 4 and Tekken 6 double pack PS3 Game. Condition is Very Good. The booklet is included and has shelf-wear to it. Tekken 6 (Sony PlayStation 3, 2009) Great Condition ~ Ps3 Game *COMPLETE*. Condition is Very Good. Shipped with USPS First Class Package. Countless fighters from all over the world begin to make their way to the arena, hoping to defeat him and claim the bounty. Those include Azazel, who has been described as one of the most difficult bosses in all of Tekken. Case has very minor wear and closes securely, disc has minor surface scratches. Booklet is included. Tekken 6 (Sony PlayStation 3, 2009); Has manual; Black Label; Disc has scratches/scuffs. USA version never opened w/ original factory seal intact. - BUY MORE SAVE MORE! Condition is Good. Item exactly as shown in pictures. You are purchasing the exact PS3 game as shown pictured. This is brand new and sealed. Tekken 6 (Greatest Hits) - Playstation 3. Publisher: Namco Sep 30 2009. Case Good. Internal SKU: DA01I-01635. Tekken 6 (Sony PlayStation 3, 2009) Complete. Condition is Good. Shipped with USPS First Class Package. Disc is excellent in original VG case with excellent booklet. Gorgeous Graphics! - The advanced high definition graphics and 3D animation technologies create the most impressive HD visuals in Tekken history. The Largest Character Roster Ever! - Master 40 unique fighters representing the world's top martial arts styles!